I confess, I’ve only done five elliptical workouts in my life. The most recent and likely last happened yesterday in my gym. All the treadmills were taken so I decided to hop on and give the elliptical another whirl. I was reminded why I avoid this machine like the plague. It was the longest 15 minutes of my life. I counted the seconds and even if you paid me I wouldn’t have stayed on any longer. During this last workout I decided that the elliptical is the lazy man’s treadmill and I hope to never have to do it again. Unless you’re absolutely incapable of running the elliptical machine is a total waste of time and I utterly loath it. I call it the lazy man’s treadmill because most people doing an elliptical workout ignore their strides per minute number, often written as SPM or RPM. This number should never drop below 60 RPMs or 120 SPMs depending on your machine’s metrix. In order to have an effective elliptical workout you need to feel like you’re swimming upright through a pool of molasses – up that resistance – typically 6 minimum! It’s really hard to force yourself to do this. The biggest problem I have with the elliptical it’s a constant thought battle – I contemplate every single step, the stride length never feels normal and I don’t get the same calorie burn when compared to a run – unless I’m really pushing through that molasses. When I’m on the treadmill I can zone out, get comfortable with my natural stride and know that I’m getting the best bang for my buck in calorie wise for my workout. Ok, If you can’t run then an elliptical a great second option. 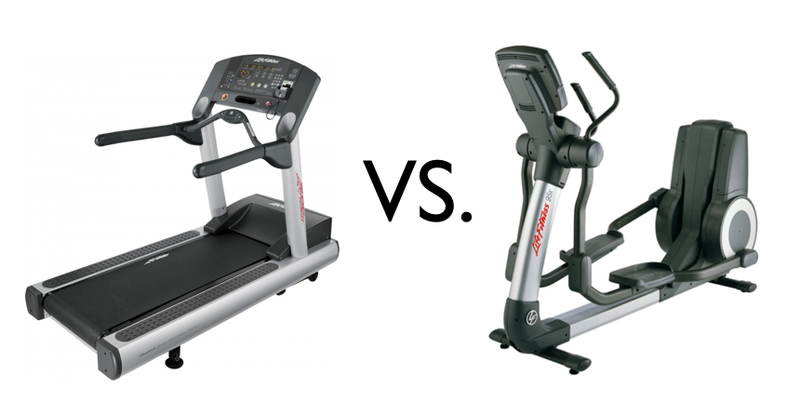 The one plus of an elliptical over a treadmill is that it may be better for your joints. But I think a little high impact training through running is awesome for bone density building. As long as you’re properly stretching and foam rolling after the run you should be ok for joint issues. The truth is you need to do you! This is what works for me. Find what works for your workout and stick with it! Bottom line: In my mind there is an absolute hands down winner – the treadmill.